Keeping up with your regular Subaru maintenance at Carter Subaru Ballard near West Seattle, WA is important for keeping up the warranty but also to ensure you get the most from your investment in your vehicle. Since Saturday is a great day to get things done, bring your Subaru in for its 30k, 60k, 90k, or even its 105k mile scheduled maintenance and save $50 off the cost of your maintenance! Plus receive a complimentary loaner car! This Saturday Special will be gone soon so grab this coupon and head west from Bellevue, WA to capitalize on this deal at Carter Subaru Ballard. When it comes to repairing and maintaining the sophisticated systems in every Subaru vehicle, only the factory trained specialists like those in our Carter Subaru Ballard Service Department should be trusted. Here at Carter Subaru Ballard, we are proud to provide customers from Kirkland, WA with no-hassle service and our Parts Department is always well-stocked with genuine Subaru parts and accessories. You can save big on your vehicle maintenance with our great deals on Subaru service and our parts savings! When we say we're your hassle-free dealership, we back it up with a full selection of great savings on our new Subaru models. Or, a certified pre-owned Subaru might be the best fit for you! We even keep a wide variety of quality used vehicles from other makes on hand so everyone can find what they are looking for. 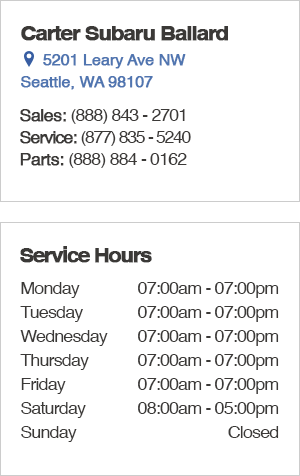 Schedule your next service by calling (877) 835-5240 or simply come by and see what we have to offer at 5201 Leary Ave. NW, Seattle, WA 98107. We are conveniently located west Redmond, WA and look forward to meeting you!